The program will be available to up to 10 young people who have career related skills, but not necessarily experience. Potential employees must be 30 or under, have participated in skills-related training or post-secondary education, be legally entitled to work in Canada, and not be in receipt of Employment Insurance benefits. Employers must have a vacant position for at least 30 hours of work per week and intend to offer permanent employment at the end of the placement period. The placement subsidy may cover 80% of the employee’s wages for up to 25 weeks. Businesses set the wage and may identify the candidate to be hired. 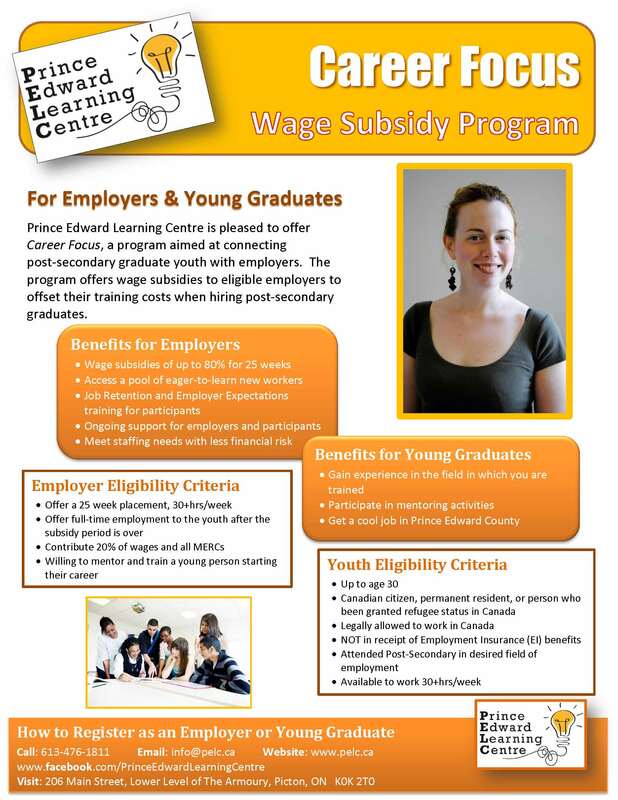 All potential candidates must be deemed eligible by Prince Edward Learning Centre prior to starting employment. Employers and potential employees should contact Prince Edward Learning Centre to register. Prince Edward Learning Centre supports adults to achieve their educational and employment related goals. They work with over 100 people each year and offer support for those completing high school or entering college, pre-employment programs for youth, and host a low income tax clinic and financial literacy programs.